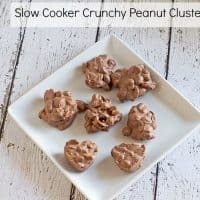 This slow cooker crunchy peanut clusters recipe is smooth, creamy and full of peanutty crunch! I absolutely love my slow cooker and use it every chance I get. These days our lives are so busy, it’s hard to always have the time to cook, even though it’s one of the things I love to do most. So, when Dollar General asked me to create a slow cooker recipe with some of their Clover Valley products, I just couldn’t say no. I love getting several things at Dollar General, even food, because they have everything I need for a quick meal, or sweet treat in this case, at some of the best prices possible. This time, I decided to tackle something I haven’t made too often in the slow cooker: dessert. I’ve always enjoyed the idea of the ease of slow cooker dessert recipes, but since I love baking, it’s not something I’ve really utilized. However, the past few weeks have been so super busy between a few unexpected events and finding out we’ll be able to move in a few weeks into a larger place instead of extending our lease next month (happy happy dance). So, since I was in the mood for a chocolatey sweet treat, I decided to make some slow cooker chocolate candy. I have to admit the first time I made slow cooker candy, I was quite surprised that it turned out so well and didn’t burn. It is important to keep in mind, though, that all slow cookers are different so the cook, or melting in this case, time can vary widely. I love making chocolates this way because I don’t have to stand over the stove for several minutes or stir and stir in front of the microwave to melt chocolate when I’m already trying to do 10 other things at once. The slow cooker is great because the candy melts without having to check it every minute, and the residual heat keeps the candy mixture soft instead of having to melt it again multiple times if you have to answer the door or go see why the kids are being too quiet. 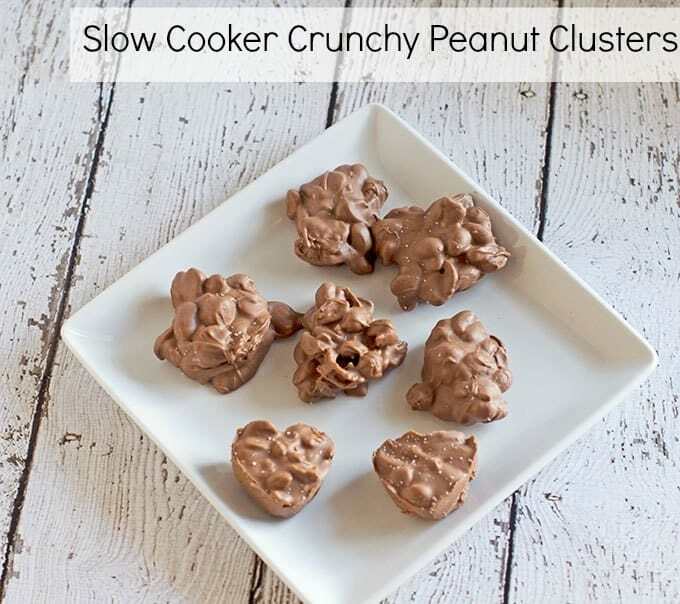 This slow cooker crunchy peanut clusters recipe is a great blend of chocolate and crunch! Place peanuts in bottom of 4 to 5 qt slow cooker in an even layer. Place cereal on top of peanuts. 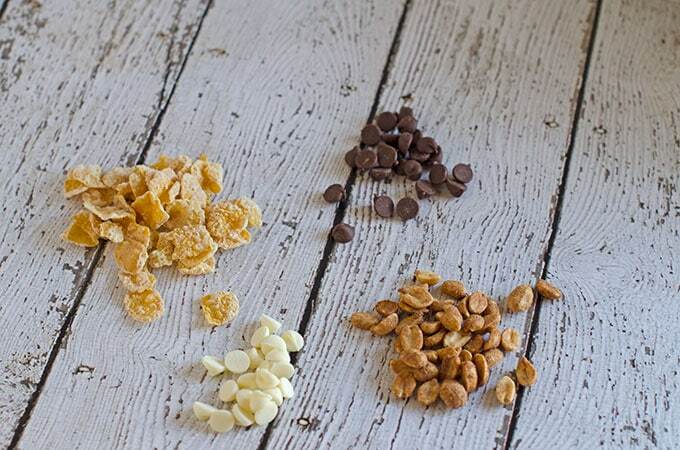 Place milk or semi-sweet chocolate chips on top of peanuts. Place white chocolate chips on top of previous chocolate chips. Add coconut oil or vegetable shortening on the top if desired. Do not stir. Place lid on the slow cooker and heat on low for 2 - 5 hours depending on your slow cooker. Once chocolate has softened and melted, stir everything together with a wooden spoon or spatula. Using a tablespoon or small cookie scoop, place scoops of the candy onto parchment paper, waxed paper, candy molds or mini muffin liners. Top with a sprinkle of salt or chopped cereal or peanuts if desired. 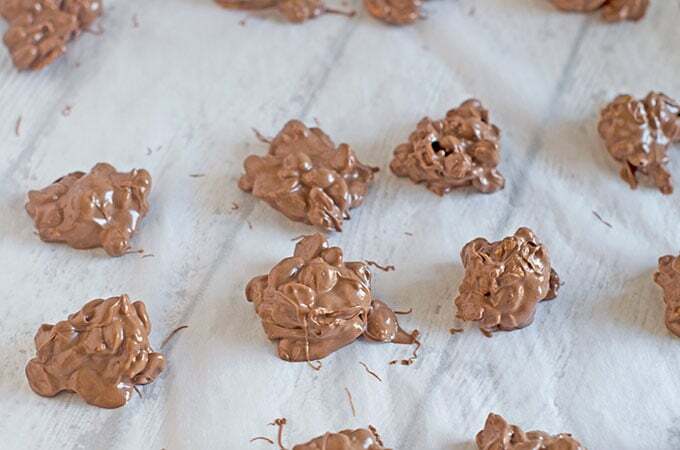 Allow candy to cool completely and harden. You can place in the freezer for 15 - 30 minutes if you need the candy to harden faster. Serve immediately or wrap and keep in the refrigerator or room temperature for up to a week. You can use different kinds of chocolates and mix-ins, but the consistency and cook time may vary. 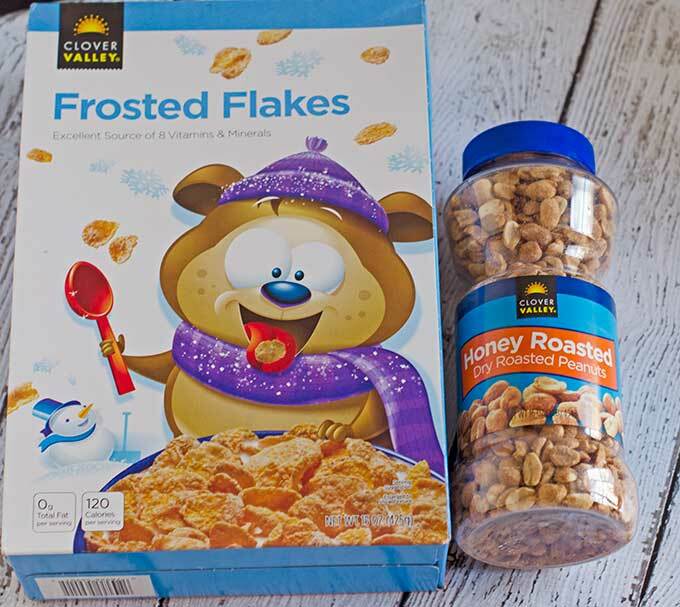 Check out more Dollar General easy meals and follow Dollar General on Facebook and on Twitter.